We’ve heard much about the “dialog” between painting and photography, and throughout history there have been many such “conversations”. This show, at least from a distance, didn’t promise to be one of them. 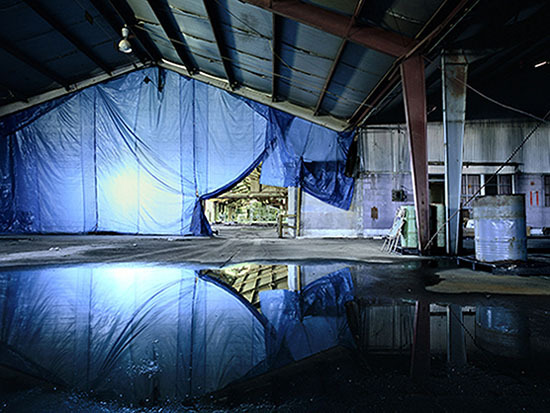 Westerhout photographs the interiors of decayed buildings; Bolles makes color field paintings. The success of this unlikely pairing shows how an inspired curatorial vision can bridge the arbitrary divide we sometimes erect between media. Both artists share an obsession with light. 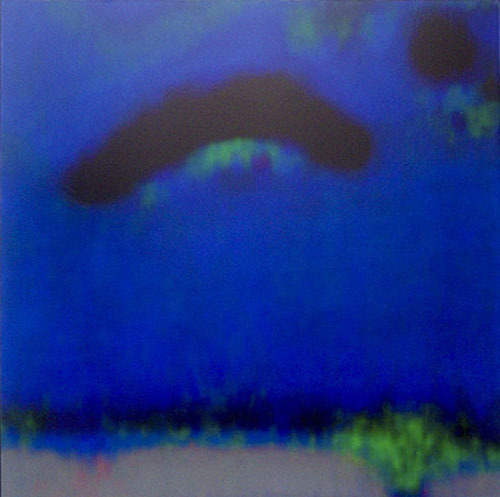 It surfaces briefly and stunningly and then fades as the show serves up examples of each artist moving in directions that are, at least for Westerhout, more narrowly focused than what we’ve seen from her in the past, and for Bolles, a striking departure from the orthodox minimalism that has defined his career up until quite recently. Westerhout makes super-saturated pictures that have the look of wet paint. 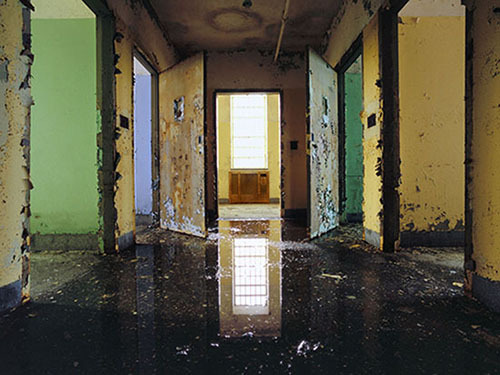 Many of the buildings she photographs are taken in regions that once sustained America’s blue-collar workforce, and for this reason she’s sometimes mistaken for a journalist; but her real interests lay elsewhere. Where her work sometimes seems too closely tethered to the conventions of architectural photography, the pictures in this show, while stolid and meticulously composed, seem less concerned with context than with demonstrating the infinite ways light can interact within a given environment. Thus, it’s tempting to think from these selections — which focus on more details rather than on whole environments — that Westerhout may be edging closer to abstraction. 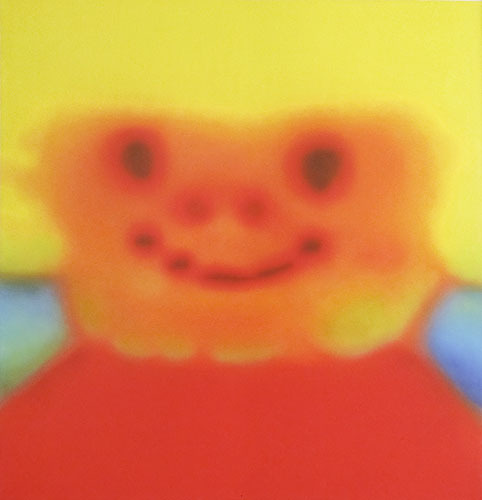 Bolles, on the other hand, has spent the better part of two decades in that realm, making luminescent (and mostly monochromatic) paintings whose primary quality – a flickering, indeterminate depth – comes from stacking layers of color-laced clear acrylic polymer on canvas. While his new work, which I’ll say more about shortly, moves in the opposite direction, toward abstract figuration and landscape, it’s his earlier (circa: 2007) paintings that connect most powerfully to Westerhout’s pictures. This occurs in the front room of the gallery where two of his untitled monochrome paintings, both rendered in shades of lime green, face off against three Westerhout pictures that employ similarly colored geometric forms that either project color outward or allow strongly tinted light to seep into darkened spaces. Oftentimes these effects are amplified by reflections in pools of collected rainwater. We see them in Kings Park Building 93-111 (2004), a former psychiatric hospital, and in Louisiana III (2005), a one-time cannery. By contrast, Bolles’ small-scale minimalist works project light as halos emanating from the edges. The effect is echoed perfectly in Westerhout’s image of an abandoned winery in Richmond, Calif., where light bleeds in from around the periphery of a sliding door, as if framed by neon tubes. Bolles’ new works at first threaten to upset this dialog, but they actually enhance it. They merge painting and photography into an inscrutable hybrid whose photographic origins are nearly obliterated. He begins by digitally manipulating photos of Fischer Price dolls. These he prints onto canvas and works manually, with a brush and a spray gun. He then coats the painted photographs with layers of tinted acrylic to further distort the underlying images. Alternately, in a series of small (16" x 16”) works, he affixes paper prints to Plexiglas panels which he paints with colored resin. In both cases, the results are the same: vacant, twisted, blown-out faces set in overheated shades of yellow, red and orange that are bisected by horizontal bands of equally saturated color. Beautiful and horrific, they feel like what we might see if Takashi Murakami attempted to channel Mark Rothko. Bolles uses the same technique to create several mysterious landscapes. Two that stand out are Little Boy Blue (2011) and Wedgie (2011). With their hanging cloud-like forms, they give off the feel of symbolist paintings. Westerhout responds in kind with Vanity Ballroom (2009), a picture of an old dance hall whose ceiling looks like it was ripped open by artillery shells. Light streams in to illuminate the room, but it’s the texture of the holes that rivets our attention. Such conjunctions provide a keen sense of just how painterly photography can be – and how paintings can function as photographic equivalents. Yet for all the formal exchanges ignited by this presentation, topicality churns beneath the surface. I don’t imagine unemployed workers taking a mystical view of Westerhout’s wrecked buildings. Likewise, with Bolles, the Murakami connection bears exploration, since the faces embedded in his pictures bear a strong resemblance to those seen in Manga comics, where frozen expressions, it has been theorized, mirror the shell-shocked psyche of a nation twice-nuked. Had Japan not recently suffered another nuclear disaster, I probably wouldn’t be thinking these thoughts. But when I look at the screaming colors in Bolles’ paintings, I can’t help but wonder if his shift, from pure abstraction to hot-colored, tortured representation, wasn’t somehow prescient. If so, it won’t be the first time an artistic impulse has unwittingly foreshadowed a historic event. Nor will it be the first time civilization’s ruins trigger an intensely personal investigation as they do with Westerhout. In this show, opposites don’t just attract; they combine to offer us a fresh vision. Katherine Westerhout and Tom Bolles @ SFMOMA Artists Gallery through April 21, 2011. Learn more about Tom Bolles and Katherine Westerhout.